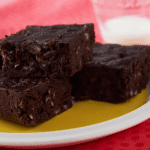 Black Bean Brownies | JPMA, Inc. If you have a blender or food processor, use it to make these brownies: Put the eggs, oil and vanilla in a blender or food processor, pulse to mix. Add beans and blend until pureed and smooth, 1 to 2 minutes, scraping down the sides of the blender or food processor with a rubber spatula once or twice. Add sugar and cocoa, and blend until mixed, about 1 minute. Add chips or nuts (if using), and pulse once or twice to mix. Proceed with step four.